​Life is a series of choices. Some are big choices, like who to get married to. Others seem small, like what to have for breakfast. Porridge? Or perhaps an egg-free tofu omelette. All these choices, big and small, have led you to this moment. They’ve had on impact on your education, career, health, and relationships. One choice leads to opportunities for more choices and pretty soon you can look back on your life as a long string of decisions. This is your story, almost as if you were a character in a book. And it all starts somewhere. But before each stage of your story can really begin, you must make an important choice. It's the choice of how to respond to what Joseph Campbell entitles "the call to adventure." In Campbell’s description of the hero’s journey, the call to adventure is where everything takes off. Our main character receives a revelation. Perhaps they discover that a whole other world exists, an unknown world "of both treasure and danger." It’s an exciting place, but also unpredictable. And so like Neo in The Matrix, they come to a crossroads. The blue pill or the red pill. It is the choice of whether to continue being comfortable with what they know, or to take a chance and step out into the unknown. Why would anyone ever leave what they know in order to be uncomfortable? That doesn’t sound very relaxing. Or safe. And more importantly, what would the neighbours think? Bilbo Baggins deals with those exact concerns in J.R.R. Tolkien’s The Hobbit. The Bagginses are seen as "very respectable" in large part "because they never had any adventures or did anything unexpected." But when Gandalf and his throng of dwarves show up on the doorstep for an evening of telling tales about the battles and treasures of faraway lands, something awakens inside Bilbo’s heart. He realizes there’s more to life than tea, buttered scones, and seed-cakes at Bag End. There’s a whole other world out there, and it starts at the little road just outside his front door. Fantasy worlds are where dreams come true, especially when it comes to Disney-style fairy tales. Sleeping Beauty, for example, is a princess expecting a handsome prince to rescue her, and that’s exactly what happens. In the end everybody gets what they wanted all along. That was 1950s Disney. But then in 2001 DreamWorks Animation came along with their little film Shrek and shattered what we think of as the traditional fairy tale. 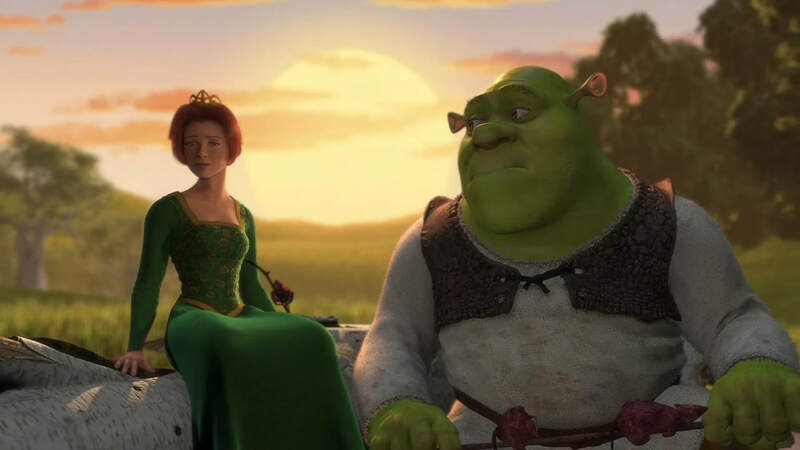 ​Inspired by the picture book by William Steig, the film Shrek starts with the reading of a story about a princess locked in a tower being guarded by a ferocious dragon, awaiting true love’s first kiss. At that moment Shrek laughs and says, “Like that’s ever going to happen!” He rips off a page from the storybook and presumably uses it as toilet paper. You’d be hard-pressed to come up with a more irreverent opening if you tried. And with that, Walt Disney’s work gets flushed down the drain. Over and over the film reminds us of our fairy tale expectations, only to dash them to pieces in front of our eyes. We watch as Geppetto sells Pinocchio for “twenty pieces of silver” and Peter Pan betrays Tinkerbell. Lord Farquaad wants to marry a princess, not out of love but to make himself king. When the Magic Mirror runs through three eligible candidates, describing Cinderella as “a mentally abused shut-in,” Farquaad can’t decide on which lucky lady to make his bride and seems to choose Fiona only by random selection. Being too cowardly to free her himself, Farquaad sends off Shrek the ogre to do his dirty work. Fiction has given us some memorable bad guys over the years. Where would Harry Potter be without Voldemort, or Sherlock Holmes without Professor Moriarty? Villains fascinate and challenge us. And they’re usually ten steps ahead of our heroes. The sci-fi villain has a high-tech surveillance system and the fantasy villain has a crystal ball. Somehow or other they find out what’s going on and plan accordingly. Sometimes a villain can come across as a mastermind. The Dark Lord Sauron, from J.R.R. Tolkien’s The Lord of the Rings, is a real schemer. As the fires burn in the depths of Mount Doom and the billowing shadow stretches across the sky from the land of Mordor, Sauron broods over his plans. He has but one goal. His whole will is bent on seeking his lost treasure: the One Ring to rule them all. With it he can subdue the world. If the Ring is destroyed, so is he. Conveniently, Sauron is in possession of Mount Doom, the only place where the Ring could be destroyed. And yet this so-called mastermind fails to take a few simple measures to protect himself, such as sealing the giant door on the side of the mountain or placing a few monstrous creatures to stand guard. How does Sauron make such a fantastic blunder? And how is he distracted by a puny army knocking at his front gate? Let’s find out. Tolkien’s book The Silmarillion covers the history of Middle-earth before The Lord of Rings, including Sauron’s origins. It turns out there was another dark lord before Sauron named Melkor, a heavenly being who sought to corrupt and wage war against creation, especially elves and humans. When his malice was revealed, Melkor came to be called Morgoth, a name you’ll remember if you, like me, have watched The Fellowship of the Ring movie more times than you care to admit. After Gandalf falls to a fiery Balrog in the Mines of Moria, Legolas calls the creature "a Balrog of Morgoth." A servant corrupted by the first dark lord. The new dark lord, Sauron, was also a servant of Morgoth at one time. Some people are just amazing. Einstein and Shakespeare, for instance, stand out as exceptional. Joan of Arc led the armies of France as a teenager. In the film Amadeus, Mozart seems to compose concertos and symphonies with little to no effort, while his rival composer Salieri painstakingly works to produce material which can never measure up. It appears some people are chosen for great things, gifted with special abilities, while others are not. And that’s reflected in the stories we tell. Let’s take a look at A Wrinkle in Time by Madeleine L’Engle. In this story, boy-genius Charles Wallace Murry speaks with a vocabulary well-beyond his years, probably on account of his reading the dictionary for fun, and at five years old he quickly grasps the concept of travel through time and space. But he’s more than just your average child prodigy. As his mother says, "Charles Wallace is what he is. Different. New." You might say, unique. The boy knows things about people without being told. He can feel around in other people’s minds, and he can usually tell whether a stranger is friendly or sinister. His gifts go far beyond what you would expect. With everything going for him, you’d think Charles Wallace would be the story’s main character. Wouldn’t you as a reader like to spend some time in the head of a genius and see things from his perspective? But instead L’Engle chooses to present the book to us through the eyes of Meg, Charles Wallace’s older sister. Meg is best known for not being able to control her temper. She gets in plenty of trouble at school and is stubbornly protective of her brother. She certainly doesn’t feel gifted. Rather, she believes she’s "doing everything wrong." Meg can’t seem to keep from lashing out, and the fact that people are gossiping about her missing father doesn’t help matters. Many fantasy stories focus on a journey, whether it’s the quest of King Arthur’s knights to find the Holy Grail or the long homeward journey of Odysseus after the Trojan War. Those chosen to come along on such quests are often selected for their loyalty. They believe in the cause. They will try to persevere until the end. These companions are faithful to the quest, but they may have no idea how to reach their destination. Like the crew of a ship, they may not know the exact path to take or which stops to make along the way. They need a captain, a leader, to guide them. But leaders can have different tactics to get the job done. Michael Scott, played by the always hilarious Steve Carell on the show The Office, has a unique perspective. While contemplating how he wants his employees to view him, Michael says, “Would I rather be feared or loved? Easy, both. I want people to be afraid of how much they love me.” The line is a reference to the 16th century political thinker Machiavelli, who came to the conclusion that “it is much safer to be feared than loved.” Rule by fear is self-explanatory. It keeps people in line. It’s practical and efficient. Rule by love, on the other hand, sounds like a contradiction. How does one even do that? The characters of How to Train Your Dragon have a possible solution. (Spoilers ahead.) The film, loosely based on the book series by Cressida Cowell, follows a boy named Hiccup, a member of a Viking village which gets raided by dragons on a frequent basis. Needless to say, they're not too fond of dragons burning down their homes and stealing their livestock. At first Hiccup is all on board for killing the dragons, until he encounters one face to face. He shoots down a Night Fury, the rarest of all dragons, and finds it trapped and injured. He approaches it with a knife as it lies helpless before him. Killing the beast would make him a hero in his village. But he just can’t bring himself to do it. And so, in a moment of mercy, Hiccup uses his knife to cut away at the dragon’s bonds and give the creature its freedom. When you hear the word hero, who do you picture? If you’re a Marvel fan you might think of Iron Man, Black Widow or Captain America. We look up to heroes like these because they can do what we can’t. They use their godlike powers to fight against evil, saving the world from one earthshaking supervillain after another. Whether our heroes have the shining idealism of Superman or the dark, gritty realism of Batman, they all use their power for good. Power seems to be a precondition. If you don’t have power, how can you do anything? And the fantasy genre is famous for giving us powerful, larger-than-life characters. Fearless warriors clash against monsters from the depths of hell. Cunning wizards bring down the skies in magical duels to the death. Mighty knights battle against fierce, fire-breathing dragons. The people of medieval times were no strangers to such tales. One of their great heroes, Saint George, was famous for reportedly slaying a dragon. But does a hero need to be powerful? While fantasy does give us some of the most powerful characters you’ll find anywhere, it also has the curious tendency of presenting us with heroes who seem weak and totally inexperienced. Think of young Charlie stepping into Willy Wonka’s chocolate factory or Bilbo Baggins being swept from his little hobbit hole on an adventure into a world of goblins and even a dragon. In The Wizard of Oz, Dorothy is followed by a band of blundering misfits, including a brainless Scarecrow and a lion who’s afraid of his own shadow. These are not the heroes of ancient epic. At first glance they don’t look like heroes at all. Christmas is fast approaching and the mad rush to purchase last-minute gifts is in full swing. The season brings with it plenty of sweets, colourful lights, and crowded department stores. For those of you in more northern climes, chances are you’ve been trekking through the snow and ice to do your holiday errands. And finally, the big moment will arrive. You give the gifts, Santa Claus gets the credit, and everybody sits down to eat too much Christmas ham, or your poultry of choice. But believe it or not, that isn’t the only way to celebrate Christmas. They do it a little differently, for example, in Narnia. When we first encounter Narnia in The Lion, the Witch and the Wardrobe it looks like a snow-laden wonderland of sorts. It’s kind of magical, really. But as Mr. Tumnus the faun soon reveals, there is apparently something sinister behind the beautiful quiet of the falling snowflakes. He tells Lucy that the White Witch "has got all Narnia under her thumb. It’s she that makes it always winter. Always winter and never Christmas; think of that!" Sounds horrible. But think of all the time you’d save not having to scour the aisles for stocking stuffers. If you remember the story, the Narnians do get to have Christmas eventually. As Peter, Susan, and Lucy Pevensie follow Mr. and Mrs. Beaver through the snow, hoping to escape from the White Witch, they hear the sound of an approaching sledge and its jingling bells. Who else could it be but the witch herself, hoping to catch them before they reach Aslan’s army? But it isn’t. As C.S. Lewis describes the scene, "on the sledge sat a person everyone knew the moment they set eyes on him. He was a huge man in a bright red robe (bright as hollyberries) with a hood that had fur inside it and a great white beard that fell like a foamy waterfall over his chest." Father Christmas himself. Why Do We Love Fantasy Literature? Have you noticed something? Fantasy has gone mainstream. What was once a genre only acceptable for a select group of people on the fringes—the eccentrics, the nerds, the gamers, the binge-readers, etc.—is now all of a sudden widely popular. People are glued to their screens watching Game of Thrones, Supernatural, and Once Upon a Time. Amazon is developing a new Lord of the Rings series and Netflix has taken the reins of The Chronicles of Narnia. Meanwhile, this year the Harry Potter books passed the 500 million mark in copies sold. Fantasy is no longer one of literature’s best kept secrets. Maybe we’ve come to realize that these kinds of stories aren’t just for children. Adults can enjoy them too. I grew up reading fantasy books. Like you, perhaps, I was guided by the wisdom of Gandalf and heeded the warnings of Galadriel. I followed along with Lucy as she stepped through the wardrobe into Narnia and with Wendy as she sailed into Neverland. These stories have stayed with me. And I’ve only gone looking for more such adventures since then. ​Why do we love fantasy? What drives us to come back to it again and again? It might help to think about what we mean by the word fantasy. In everyday conversation the word can have an unhealthy connotation. It denotes something we think about continually but which is very unlikely to happen. Fantasizing denies what’s real. And it can cause real-world problems. For example, your office co-worker might be convinced that, despite all evidence to the contrary, you are secretly in love with them. Nothing could be further from the truth, yet they refuse to believe their eyes and ears. Or you might miss the first half of the latest Marvel movie because you mistakenly believed the showing started an hour later. Join the conversation as we explore the best of classic fantasy literature and beyond.